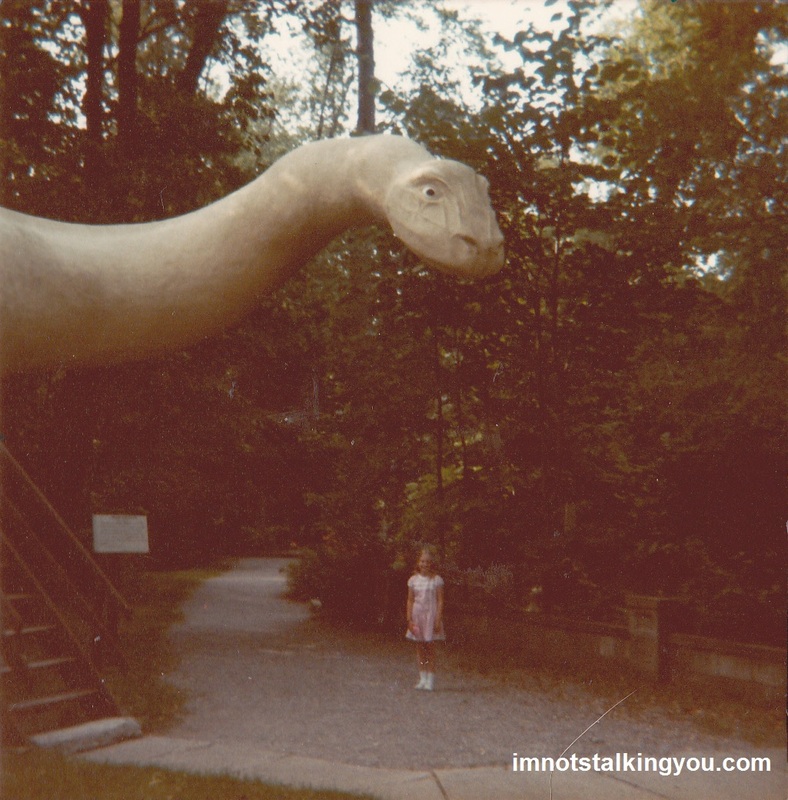 Dinosaur Gardens | I'm not stalking you. My family was lucky enough to get a chance to escape up to northern Michigan this summer. This gave me the opportunity to introduce my son to the land of dinosaurs, better known as Dinosaur Gardens. You see, I visited there when I was only a little older than he. And I not only lived to tell the tale, but I left with proof. I didn’t tell my 4 1/2 year old son where we were heading. 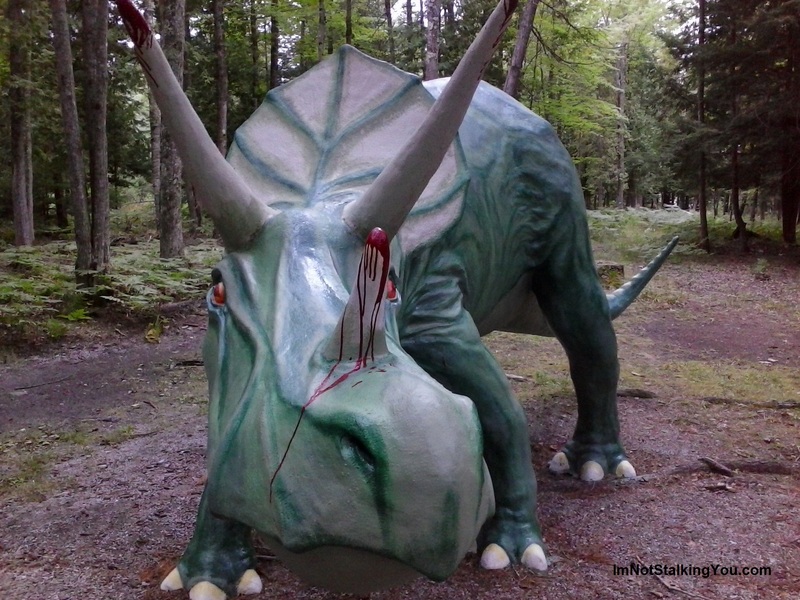 I had visited the Dinosaur Gardens website, but I was still afraid that maybe they would be closed or something. Then, of course, he was asleep when we arrived. 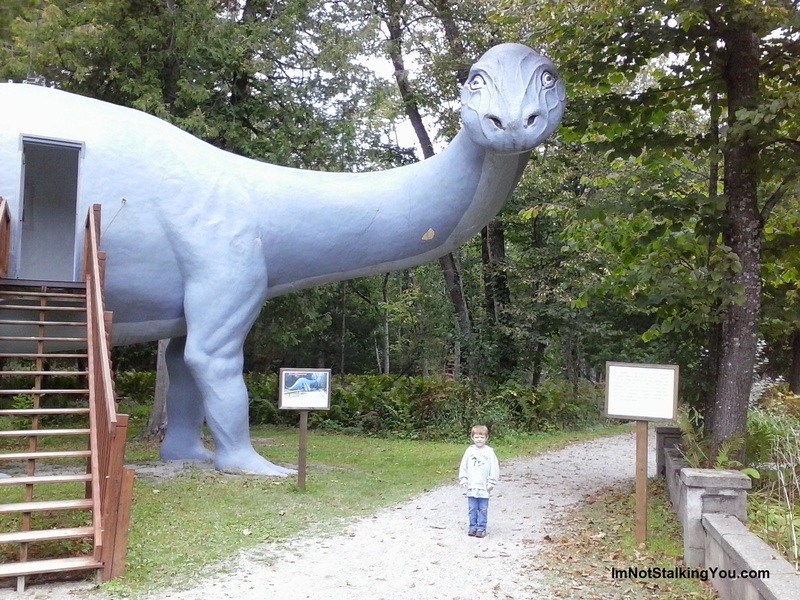 I groggily took him out of the car and, holding him lovingly to me, said, “Hey, look what is over there in the woods!” and pointed out the giant brontosaurus to him. An immediate look of horror crossed his face. This is a little boy who actually likes scary things. (And making up stories. I am planning on him to be the next Stephen King.) But, well, apparently he doesn’t like them when he first wakes up. We took him into the gift shop, where the sight of toy dinosaurs quickly woke him up. In time he became so comfortable, he even began to feed the creatures himself! M feeding one of the animals. I had told my husband that my mom had brought me here 30 years ago. He asked me how she knew about it. 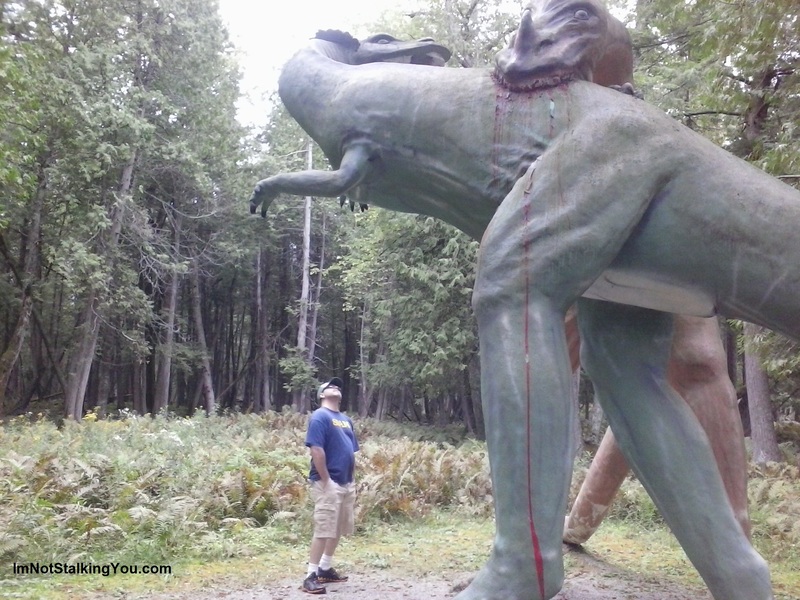 My mother’s grandmother had a newspaper clipping she had saved about the extraordinary sculptures someone had made in Osseneke, Michigan. So, they had brought my mom (and most likely her older brother) up here once when she was a girl. 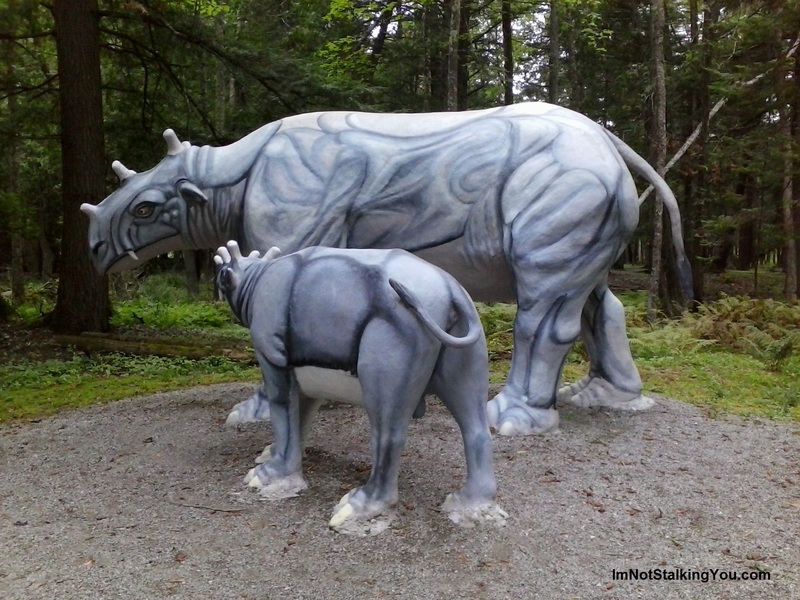 I love that this roadside attraction, many of which thrived in the days of drive-ins in the 1950s but have since become extinct, continues to roar on for generations of my family. Even my husband was charmed. I asked my son if he would bring his kids back to visit. He said that he would, and that I could come too. I think it is amazing that this tourist attraction has survived for 80 years. And not only been maintained, but improved! There were two new exhibits that had been added in recent years. While we were there, we saw several concrete statues that had either been recently repainted, or had had their previous paint carefully removed and were primed for a new coat. This was the only sick animal, and I thought it was very clever how they explained his illness. I love that all this was created from one man’s imagination gone wild. He stood on this piece of land and saw that the fabric of time was thin here, that others would be able to come after him and experience prehistoric times as he could, with a little help from his own hands. 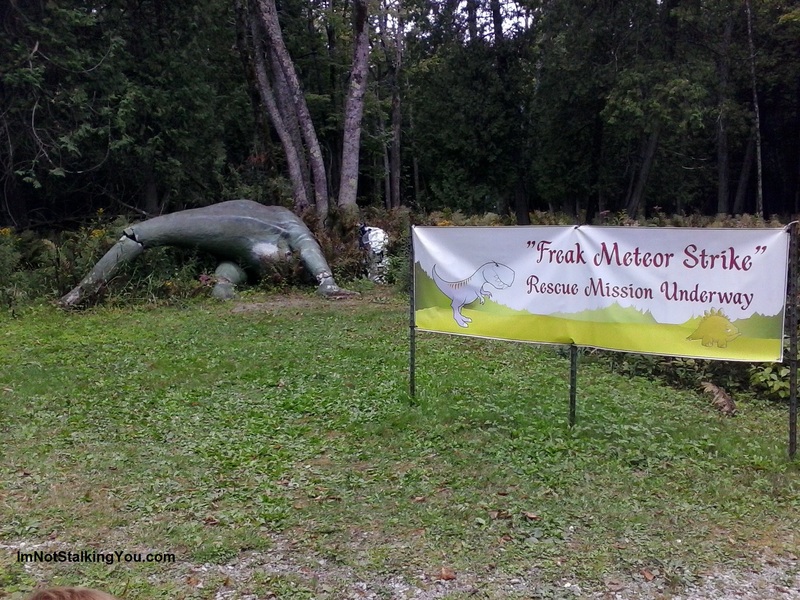 I love that he had a dream that most would call crazy, to build dinosaurs in northern Michigan’s harsh climate. But he did it. And it has endured for nearly a century. Yes, I had to recreate the past. That is all I am asking out of my writing career. That isn’t too much to ask for, right? 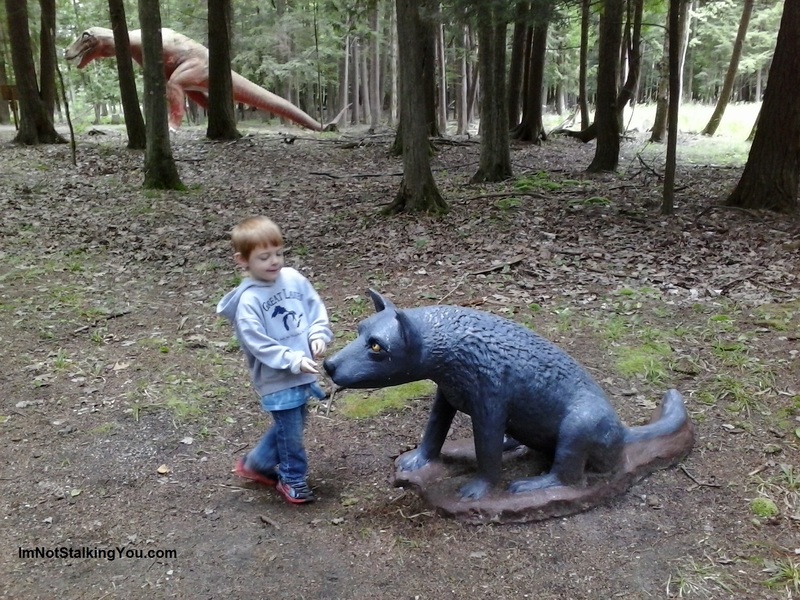 Posted in A day in the life, Childhood Reminiscing, Entertainment Worship & Review, UnProfessional Photography & Artwork and tagged attraction, dinosaur, Dinosaur Gardens, forest, garden, jurassic, Lake Huron, life size, Michigan, northern, Ossineke, park, prehistoric, roadside, tourist, trap, US23, woods, zoo. Bookmark the permalink.